What does “home” smell like to you? What smells make you feel happy? These are things that air fresheners are designed to address – inject your home with smells to make you feel good. What you may not realize is how dangerous these smells can be to your health. 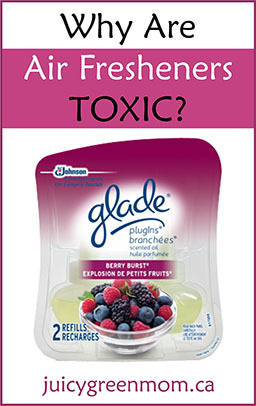 So why are air fresheners toxic? They are full of toxic chemicals, which don’t need to be disclosed. There are no regulations around air fresheners so companies do not need to disclose any of the ingredients in these products. If you look at the air fresheners down the grocery store aisle, take a look at the packaging and see if you can find an ingredients list. Very likely not. Even if there are ingredients listed, chances are the terms “fragrance” or “parfum” are used. (Because using the French word for fragrance means it’s not as bad. Not.) If you’ve read my post on ingredients to avoid in skincare products, then you know that the word “fragrance” can encompass hundreds of chemicals hidden behind that word. National Resources Defense Council has a paper on this topic, and Environmental Defence has a great Guide to Fragrance (focusing on perfumes) that explains why this is such a big deal. Also, air fresheners don’t actually do anything about existing odors, they just mask the odors with other smells. 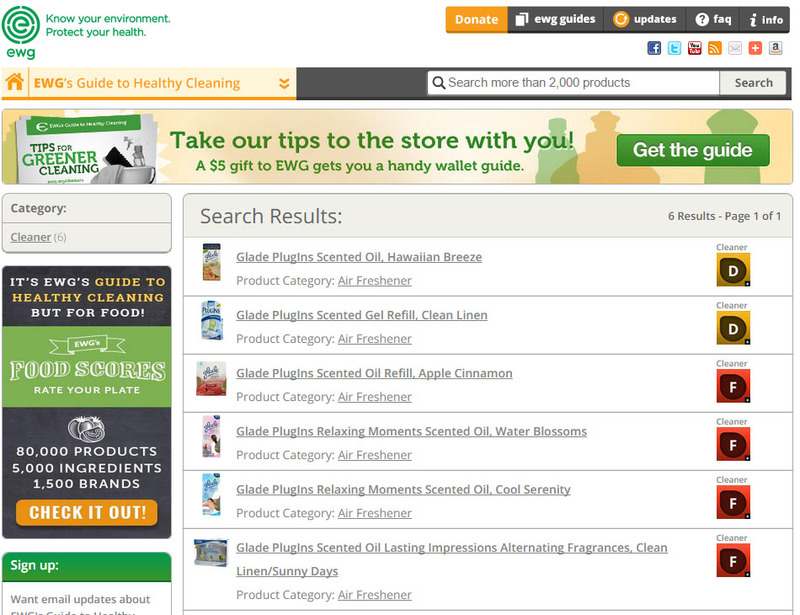 Environmental Working Group (EWG) has a database you can search for cleaning products, as well as air fresheners, to see how they score in terms of toxicity and hazard to health. Find it at EWG’s Guide to Healthy Cleaning. 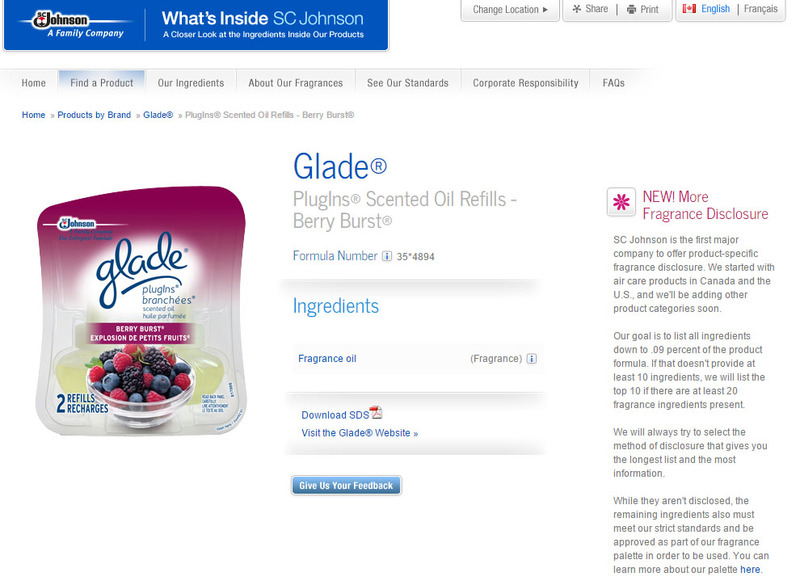 Here’s what I found when I searched for “Glade Plug In”. I don’t know about you, but scores of D and F mean FAIL to me. Aack!! I know a lot of people are jumping on the Scentsy bandwagon lately because they claim to have “natural fragrances”. (A little greenwashing, anyone?) They are no better than the other air fresheners, I’m afraid. Traditional candles are made of petrochemicals in the first place, and when you add “secret ingredients” to the mix and heat them up – it’s just not a good combination. Here’s a thorough breakdown of why Scentsy candles are dangerous. There are many ways you can improve the quality of your indoor environment and avoid using toxic air fresheners. What do you use instead of air fresheners?